It is always a pleasure photographing a wedding reception at the Hotel Dupont in Wilmington, Delaware. This unique sophisticated venue is located in Wilmington Delaware and has been hosting signature wedding celebrations since 1913. If you are looking for a spectacular place to get married and one of a kind wedding experience, look no further than Hotel du Pont. Designed in a French Neoclassic style, the Gold Ballroom at Hotel Du Pont is an extraordinary space for wedding celebrations. With its dramatic ceilings, chandeliers and bas-reliefs it creates an impeccable ambience and a timeless royal feel. Photographing wedding ceremonies and receptions at the Gold Ballroom at Hotel Du Pont is always a marvelous experience for us as wedding photographers. First, this ballroom is huge. The Gold Ballroom at Hotel Du Pont can host up to 500 guests for a wedding! It gives us an opportunity to move around seamlessly throughout wedding receptions and ceremonies without being distractive. We are also able to take advantage of multiple angles that we can photograph from. Another wonderful feature of the Gold Ballroom wedding receptions at Hotel du Pont is the ambient light. I adore the warm red, orange and yellow uplighting colors that the venue provides for the wedding receptions. It looks phenomenal on photographs and creates such a beautiful scene for the entire room! Even though there is not much outdoor space outside Hotel Du Pont, we are always happy to take advantage of all the gorgeous interior of the hotel for your wedding photos! The options are endless. The lobby of the Hotel Du Pont has spectacular windows that provide for lot of natural light. The grand staircase leading from Hotel Du Pont's du Barry Room is an impeccable location for bride and groom portraits together or bridal party photos. If you are having your wedding reception at Hotel Du Pont, definitely take advantage of the space prior the reception is filled with guests. Getting some intimate portraits taken of two fo you together in the empty reception room is always a wonderful addition to your wedding album. 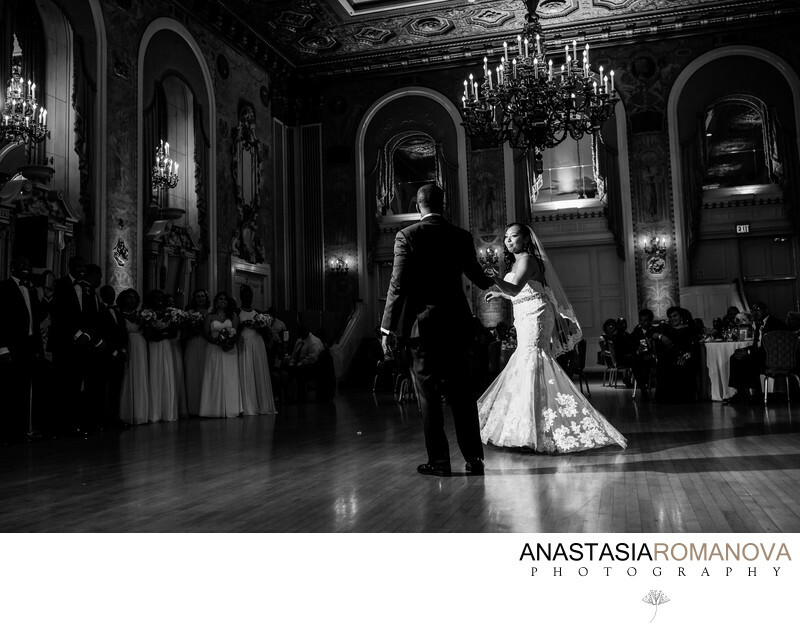 And Hotel Du Pont's Gold Ballroom is offers a perfect backdrop for that. 'How much does it cost to have a wedding at Hotel du Pont?'. It is probably one of the first questions the newly engaged couples are researching as they start planning their Big day at this stunning venue. The Wedding catering average price per person is $147, according to Wedding Wire.